…might be an apple, a crabapple, a pear or a quince. All the above are a part of the family Rosaceae. What to do, as we’re almost out of preserved apple products in the house? Our next-door neighbor has a lovely large-fruited crabapple tree, and he encourages me to pick them. I was a bit too busy this year to do so at the proper time so I passed; crabapple jelly can wait another year (that, and I have two pints left from last year). Our ancient apple tree is a biennially bearing and this was an off year. Our nascent orchard is a good 3 years from producing for us. The other neighbor’s trees are bearing but dang are the apples puny. So: after our nearly fruitless hike on Satuday, the kid and I got in the car. I got up the courage to stop at a neighboring farm. I had admired their orchard for years, and, as far as I could tell, the trees weren’t being tended or picked. I came armed with gifts of grape and strawberry jam: might we pick your trees, I asked? Oh yeah. Go ahead. And there’s pears and quince around the side of the house you can have, too, said the owner. Now you’re talkin’. My favorite local fruit grower has been holding off on picking his quince but should have ’em on Saturday. I think over the years I’ve introduced almost everyone I know to quince and everyone has liked it. Just last week I finally remembered to take some quince to my mother in Ohio. 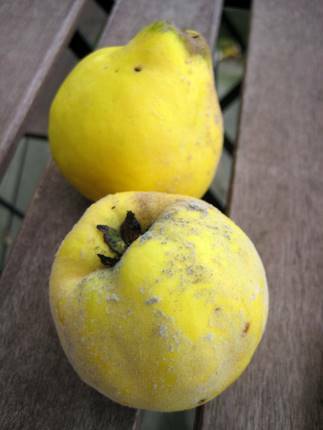 She’d been telling me that she never liked quince but now at 89 she’s changed her mind. Good for you for asking! And congrats on the haul. But now you have to process them, right. Aye, there’s the rub. I found out that an apple orchard near our farmland allows groundfall picking for 15 cents per pound, and they have some organic apples. But they only allow this after all the fruit has been collected from the trees. I’m trying to decide whether this is going to be worth it, and whether or not it will align in time with pressing our own apples. You should write a pome poem. That’s my kind of harvest–apples and pears. I’ve never tried quince; I’ll have to look for it. Do you just add it with the other fruit? Marcie that proves one is never too old to change one’s mind about foodstuffs! A good thing. Yes, quince weren’t something that interested me much either in the past, mainly because I had to pay for them :0 but also because I never really did much with cooked fruit before the kid came along. This “tree” (which was a rather shrubby thing) my neighbor thought was probably close to 100 years old: it was his wife’s great-grandmother’s tree. Hi Pamela. Yep: they’re a bit more firm than the apples but I just peel and core them and cook them up with a big pot of apples. We like our applesauce as a sauce and not chunky so the flavors blend together nicely. 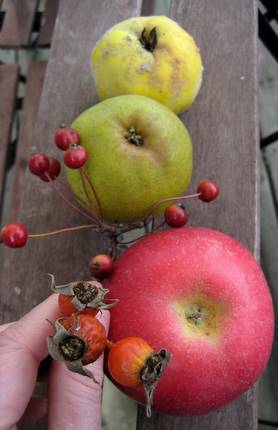 In my herbal studies and in my gardening this year, I’ve been meditating on the Rosaceae family — apples, roses, hawthornes, crabapples. It’s been a joy to use them and learn from them. For instance, I planted an “apple rose” that has glorious hips that almost smell spicy like bay but taste sweet. I made crabapple jelly. I’ve been drinking hawthorne tea to help ease my heart and spirit, and I noticed a similar relaxed-and-at-peace effect when I ate some home-made applesauce last week. So now, since it’s apple season, I’m focusing a lot on how apples nourish and heal. I don’t think many people think of the medicinal uses of apples — except for the old proverbial way of keeping the doctor away. 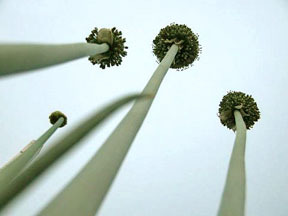 Also, we recently planted 13 apple trees so I share your anticipation of the orchard to come.